The Mydax Opdax Chiller Controller offers a microprocessor-based control system which incorporates ease of use for the operator with powerful controls. The Opdax HMI controllers feature a menu driven system equipped with an interactive color touch-screen display. System controls are exceptionally comprehensive and provide user input, along with built-in diagnostics and error messages. 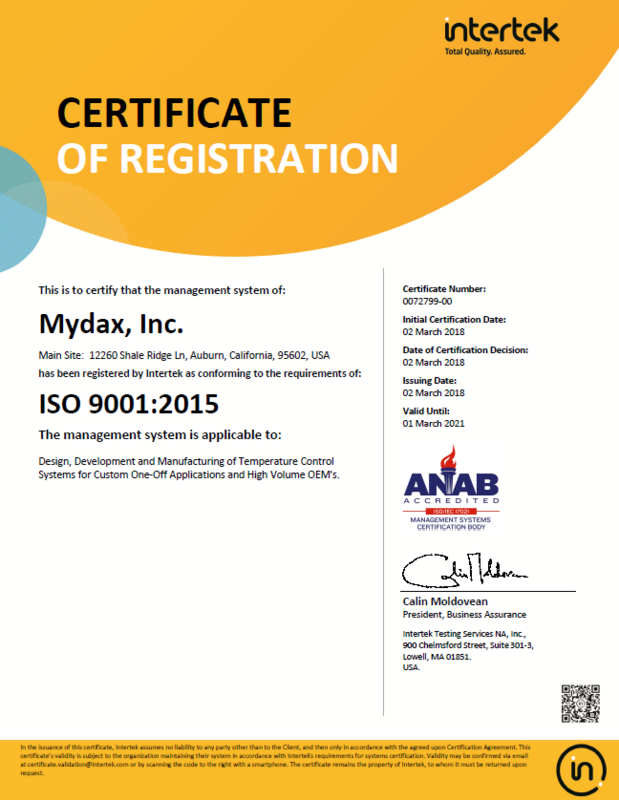 The Mydax Opdax 101, Opdax 202 and Opdax 303 Chiller Controllers offer a microprocessor-based control system which incorporates ease of use for the operator with powerful controls. The Opdax HMI controllers feature a menu driven system equipped with an interactive color touch-screen display. System controls are exceptionally comprehensive and provide user input, along with built-in diagnostics and error messages. The Mydax system user has the ability to choose a constant flow output and the system will automatically adjust the pump VFD to maintain the output flow even as temperature and fluid viscosity changes. The user also has the choice to pick a constant VFD output percentage if they desire. The Ramp Program allows the operator to create a profile that includes the choice of up to 8 different Start / Stop output temperature setpoints as well as the Ramp time between setpoints and how long to Pause at each setpoint. The program can run once or repeat the cycle. This allows powerful control over the Mydax chiller system’s cooling and heating for the end user’s process. Diagnostics Displays include up to 10 additional system temperatures, the refrigerant pressure, internal control parameters, drive signals, and more. To get you up-and-running quickly, offers MydaxRemote(TM) for RS-232 communications running in Microsoft Windows.